This year’s Budget had a totally different feel to a normal Budget. It is the longest Budget speech that I can recall (almost 40 minutes compared to the normal 30 minutes). I don’t recall applause being interspersed during the budget speech. And, normally a Budget will offend someone, but this year there are no nasty surprises. It is also different in that it is a budget that the nation gets to vote on with an election to be held by mid-May. The Federal Budget reveals the first Budget surplus in more than a decade at $7.1b for 2019-20. Government forecasts show surpluses over the next 4 years totalling $45b based on forecast growth of 2.75% in 2019-20 and 2020-21. The proposed tax cuts should stimulate the economy as is it likely that most of the tax savings will be spent and so be recirculated in our economy. The Government has again benefitted from a series of strong outcomes for commodity prices and also from strong employment growth. Low inflation has helped too. These positive factors have provided some useful room for spending. There is substantial spending on infrastructure with many rail and road projects announced. The government has increased its planned spending on infrastructure, and now intends to deliver a total of $100 billion of investment over the next decade (including existing commitments), with a focus on ‘busting congestion’ and improving connectivity. There are a number of health initiatives including additional funding to GPs both for a new chronic disease funding model which will provide grants for enrolling elderly patients with their practices and delivering treatment over the telephone, email or Skype and lifting the Medicare rebate indexation freeze. There is also substantial funding for mental health and new PBS drug listings. This tax offset is currently $200 as a base and increases to a maximum of $530. The offset will be increased to $255 as a base and a maximum of $1,080. The maximum benefit will be for those with incomes from $48,000 to $90,000. However, there is some benefit for those with incomes below $48,000 and those between $90,000 and $126,000. These revised amounts will apply for the financial year ended 30 June 2019 and will be delivered via an additional tax refund upon lodgement of 2019 tax returns. It was expected that there would be a further statement in relation to the previously announced removal of the CGT main residence exemption for non-residents. However, there is no comment in the Budget in relation to this. Some commentators interpret this and recent comments by the Assistant Treasurer at a recent tax conference, to mean that the measures are unlikely to proceed. These rules were originally to have applied from 30 June 2019 and is contained in legislation that is not yet been passed by the Senate. The instant asset write off for assets costing less than $25,000 that has previously been available to businesses with a turnover of $10 million or less has now been extended. 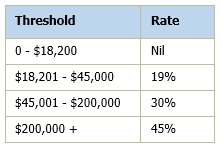 Assets costing less than $30,000 acquired from 2 April to 30 June 2020 by businesses with turnover less than $50 million will now be eligible for the immediate tax write off. Division 7A requires benefits provided by private companies to related taxpayers to be taxed as dividends unless they are structured as Div 7A complying loans or another exception applies. The Government issued a consultation paper in October 2018 in relation to proposed changes to Division 7A. These changes were to take effect on 1 July 2019 but there were substantial concerns in relation to the way in which these rules operated. It is proposed that these new rules will now be effective from 1 July 2020 which will allow further time to consult with stakeholders and to ensure appropriate transitional arrangements so taxpayers are not unfairly prejudiced. The government will provide $1b in additional funding to the Australian Taxation Office to extend the Tax Avoidance Taskforce operations which focus on large corporations and high wealth individuals. In addition $42.1m will be provided to the ATO over four years to increase activities to recover unpaid tax and superannuation liabilities. The Budget announced a new $525 million skills package. It seeks to create 80,000 new apprenticeships over 5 years in industries with skills shortages. The Government will double incentive payments to employers to $8,000. New apprentices will also receive a $2,000 incentive payment. Eligible occupations will include: Carpenters and joiners; Plumbers; Hairdressers; Air-conditioning and refrigeration mechanics; Bricklayers and stonemasons; Plasterers; Bakers and pastry cooks; Vehicle painters; Wall and floor tilers; Arborists. An additional $60 million will be made available over the next three years to help more businesses export their products and services around the world via the export market development grants. principal (rather than agent) status for the export business all (some exceptions apply, such as non-profit export-focused industry bodies). The Government announced that it will provide $9.2 million over 4 years from 2019-20 (and $2.3 million per year ongoing) to establish a dedicated sham contracting unit within the Fair Work Ombudsman to address sham contracting behaviour engaged in by some employers, particularly those who knowingly or recklessly misrepresent employment relationships as independent contracts to avoid statutory obligations and employment entitlements. From 1 July 2020 individuals aged 65 and 66 will be able to make voluntary superannuation contributions without having to meet the work test. Voluntary contributions include after-tax (non-concessional) contributions, tax-deductible (concessional) contributions, voluntary employer contributions and spouse contributions. The work test requires that individuals aged 65-74 must work at least 40 hours in any 30 day period in the financial year in which the contributions are made. From 1 July 2020 this work test will apply to individuals aged 67-74 and is a measure to give greater flexibility as individuals near retirement. The Government will also update the superannuation contribution rules to allow people aged under 67 to make three years’ worth of after-tax (non-concessional) contributions in a single year. Under current contribution caps, that would enable under 67 year olds to contribute up to $300,000 in one year. Currently this is only available to people aged under 65. Under the proposed changes, individuals will be able to contribute to their spouse’s superannuation where the receiving spouse is under age 75. Currently a receiving spouse must be under 70. In addition, if the receiving spouse is aged 65 or 66, they will no longer need to meet the work test. The work test will continue to apply if the receiving spouse is aged 67 or over. The Government will provide $282.4 million over 5 years from 2018-19 for the release of an additional 10,000 home care packages across the 4 package levels. The Government is also providing a $320 million general subsidy boost in 2018-19 for residential aged care and 13,500 new residential care places. The Budget confirmed the Treasurer's announcement of 31 March 2019 that more than 3.9 million Australians will receive a one-off Energy Assistance Payment to help with their next energy bill and cost of living expenses. The payment of $75 for singles and $125 for eligible couples ($62.50 for each member), who were eligible for certain social security payments on 2 April 2019 and who are resident in Australia, will be exempt from income tax and will be paid automatically before the end of the current financial year, subject to the passage of legislation (The ALP has indicated it would likely support such measures). The Government will automate the reporting of employment income for social security purposes through Single Touch Payroll (STP). The measure is expected to save $2.1 billion over 5 years from 2018-19. From 1 July 2020, income support recipients who are employed will report income that is received during the fortnight, rather than calculating and reporting their earnings. Each fortnight, income data received through an expansion of STP data sharing arrangements will also be shared with the Department of Human Services, for recipients with employers utilising STP.